The JM Smucker Company recently announced a voluntary limited product recall. 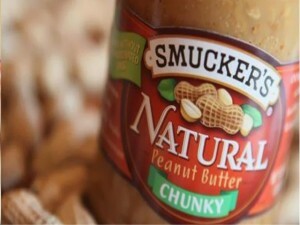 The product involved is Smucker’s® Natural Chunky Peanut Butter, which is believed to be contaminated by the bacteria Salmonella. The Chunky Peanut Butter product was dispensed in the areas of Arkansas, Delaware, Indiana, Kansas, Maine, Michigan, Missouri, New Jersey, North Dakota, Oklahoma, South Dakota, Virginia, District of Columbia, Colorado, Illinois, Iowa, Kentucky, Maryland, Minnesota, Nebraska, New York, Ohio, Pennsylvania, Texas and Wisconsin. The recalled peanut butter is packed in 16-ounce jars, with a UPC code of 5150001701. The UPC code can be found on the jar’s side, just below the product’s bar code. Product description indicates the peanut butter is a chunky product, and not creamy, with a “best if used by” date of August 3 and August 4, 2012. Production code indicated on the product is 1307004 and 1308007. Affected products were sold between November 8 to 17, 2011. Salmonella is one of the most harmful bacteria that can contaminate food and infect people. Common symptoms of infection by this bacterium include high fever, nausea, abdominal pain, vomiting, and sometimes, bloody diarrhea. In some instances, a Salmonella infection can lead to severe illnesses like arterial infections, arthritis and endocarditis. Salmonella infection can even be fatal to children and those who have weak immune systems. To date however, there have been no reports of medical emergencies that are linked to the recalled product. JM Smucker emphasizes that no other product is affected by the recall aside from those that have been specified. The recall was made out of caution for the safety of consumers. Consumers who have questions about the recall can call JM Smucker’s hotline at 1-888-550-9555. Customer service assistants are available to answer calls from Monday-Friday, or consumers can hear a message about the recall 24 hours a day.